All of Chistelow’s illustrations give the dog a real personality. As the girl shops for an extra-large dog biscuit, Walter presses himself hopefully against the glass door. As she lays the presents out on the family’s coffee table, the dog lowers his nose to sniff them all, and wags his tail enthusiastically. He’s still wagging his tail when the girl goes to sleep on December 23rd. And he’s still wagging his tail the next morning – when the girl discovers all of the wrapping paper has been mysteriously torn to shreds. At 40 pages, it’s a little bit longer than the typical children’s story, but the story keeps its happy energy going. 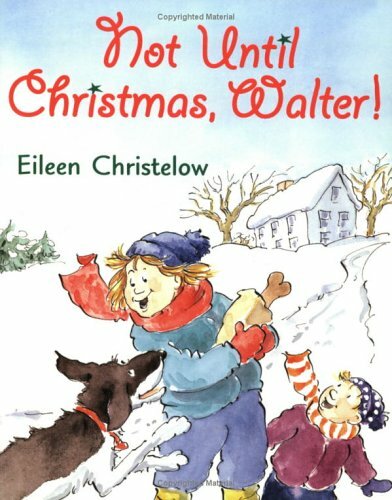 The dog ends up in the doghouse, but then the little girl gets lost while looking for a Christmas tree, and it’s ultimately the family’s dog that tracks her down. And I thought Christelow came up with a surprising and funny twist for the ending of the story. The dog is about to steal the new dog biscuit that Louise has wrapped up for him. But just then, Santa Claus comes down the chimney, and startles the snarling dog. Santa also gives Walter a dog biscuit, which makes him look guilty when the little girl discovers him.